Caketoppers is a mail order cake and cupcake company, established in 2002. We deliver personalised celebration cakes, cupcakes and edible decorations across the UK and everything is available to buy online for next day delivery. 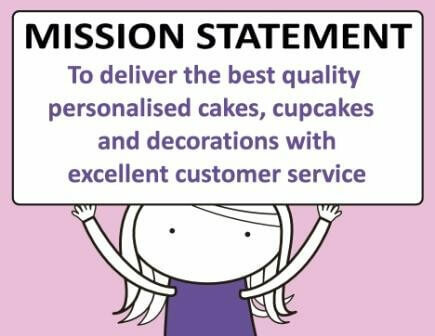 Our speciality is personalised edible photos, logos and messages printed on cakes and cupcake icing. We can transfer anything on to a cake or cupcake by printing on icing using food grade, edible inks. This includes any photo, picture, wording, image, logo, branding, artwork - in fact anything that could be printed on a normal printer. We are experts in cake printing with many years experience. Our high standards mean that you can be assured of top quality products together with an efficient, professional service every time. Our experienced team can give advice on printing your image or the best kind of packaging to suit your needs. Our cupcakes and cakes are of the highest quality and they taste as good as they look! Our talented cake makers also supply Selfridges, Harrods, Waitrose and Fortnum & Mason, amongst others. Everything is made by hand using only the best quality ingredients. They are baked and iced in large batches, which is how we can offer a next-day delivery service to our customers as we always have plenty of fresh stock. Because the cakes and cupcakes are covered in icing the sugar preserves the sponge naturally, so they keep very well. We guarantee they will stay fresh for a minimum of 5 days, but usually they last even longer. Our sponge cakes are superb with a moist, soft texture that melts in your mouth! They are made from only the finest ingredients including free range eggs. The cakes are square in shape, covered in white sugarpaste icing and sit on a thick cake board (drum). They are available in two flavours - golden sponge with raspberry jam & buttercream filling, or chocolate sponge with chocolate buttercream. Our cupcakes are really delicious - very moist and light with a thick topping. Made with the finest ingredients including free range eggs, they stay fresh for several days as the foil cases and iced top keep in the moisture. The cupcakes are available in two flavours, sponge and chocolate. They should not need to be kept in a fridge - just store in a cool, dry place. Click here for a full list of ingredients and more information on our products. Caketoppers was founded in 2002 by our Managing Director, Christine Potter. Christine was working in the corporate world, baking and decorating cakes in her spare time. While trying to figure out how to get pictures and text from a computer on to a cake top, Caketoppers was born! We started printing and delivering edible cake decorations, and we were the first company in the UK to offer this service online. Many customers also wanted cakes and cupcakes delivered. So after extensive trials we developed the best kind of cake, cupcake and packaging to safely send them by mail order. As the business took off we moved from the spare room of Christine's house into commercial premises. We moved again in 2012 and are now settled in at Hurlands Business Centre in Farnham. Are you looking for wholesale cupcakes at trade prices? We partner with various online gift suppliers including florists and hamper companies. We can deliver white label products so you maintain your brand identity, while we do all the work. Please contact us for more details if you would like to become a partner.